your one stop shop for a caffeine fix! Need that boost to stay awake for your test or big presentation at work or school the next day? Exhausted and don’t want to get out of the car with the kiddos? Need the fuel to stay alert for a long road trip? Craving a delicious, fresh sweet-treat? We got you covered, all without getting out of the car! Around here, we believe in celebrating everything—whether it's graduation, hitting those quarterly goals, or finding your Soda Soulmate. Whatever it is, we've got you covered. 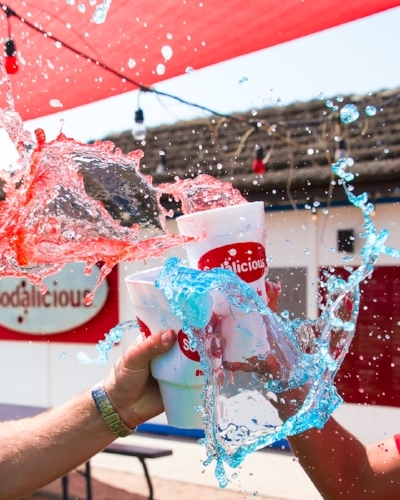 We want to hear your Sodalicious idea! Tap into your inner mixologist and share your menu-worthy drink! Come pick-up drinks for your office! It's 3p.m. You've officially hit the afternoon slump, but you have your Q4 meeting in half an hour. Everyone needs a pick me up and you have the answer. Fill out one simple form with everyone's drink of choice and pick them up 20 minutes later at your preferred location. Our custom drink carriers make it super easy for one person to get drinks for the whole office. Call one of our stores to pre-order now! Forget the can—how does sipping from your very own refillable mug sound? Or wearing one of our custom t-shirts? You don’t want to miss out on this limited edition swag. Raising money for a good cause? Let us help you meet your goals—host a fundraising night at Sodalicious! For one evening, we'll donate a percentage of sales, and we'll even help you advertise! We love everyone hard-working, fun, and a little bit sassy. We want to make sure that the soda fam knows we love them as much as we love caffeine. That's why we randomly reward our biggest fans with discounts, samples, free drinks, and merch. Who knows? Maybe the next time you're here you'll get Lucky.